[miau] The oldest gaming industry company known as Williams Interactive has introduced another slot game for all to enjoy and win big! Their latest online thriller is Bier Haus which transports players to a German party to celebrate Oktoberfest, so pull up a chair and fill up a Stein! Many walk-in casinos offer Oktoberfest themed slot machines and if you have ever played one you know how amusing the whole machine and animations can be. 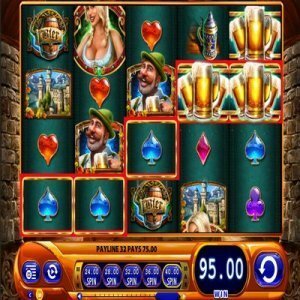 This theme definitely entertains (along with authentic Oktoberfest music) so many players anticipated its arrival, therefore it is not surprising to know that this has become one of the favorite on-line slot games. Nearly a beer festival for one, this is a G+ Deluxe game which means the reel symbols are a bit larger and it offers plenty of energized animation upon winning such as the accordions, beer maids and steins overflowed with frothy liquid. After making a bet to spin, the player is given the chance to maneuver their way around the familiar Oktoberfest tokens like sudsy bier kegs and accordions while anticipating cash prizes. Keep in mind that the control panels for Bier Haus are located at the foot. Using the panels the player can control all the features of the game such as the settings and the stake options for coins. With each spin the player will view several symbols depicting the same pictures which tend to provoke the player, making them feel like they are sure to win and like any slot game they do eventually but it may take some spins. Bier Haus can actually give great payouts, but like any slot machine game, one must play it at the right time. Bier Haus offers players the Wild symbol which constitutes a mug of beer symbol. These will replace the additional symbols when playing for the winning combination symbols (except the Scatter symbol or the blonde barmaid). There is another bonus symbol which is the beer maid holding a stein. When the player spins five or more of these gals, bring out those Baravian pretzels because you now have access to the bonus round which allows for free spins! While the bonus round gives the player five free spins, one can win up to 80 spins. While you’re playing the free spins, the Wild and Scatter symbols will be sticky. Here is when the merrymaking truly begins as players hear songs being sung in drunken harmony, so you feel like you are at an Oktoberfest celebration, plus you could be a big winner! The game is provided in a minor, major and a stand-alone version in order to keep jackpot values increasing; this game’s German man symbol pays the most, which is followed by the castle, beer kegs and large beer mug. This game has a line slot that is fixed in order to accommodate 40 pay lines. One can start the betting from .01 up to 5.00. For convenience (or if you want to enjoy a Berliner weisse) this game provides players an auto-play button. The graphics and German music make Bier Haus quite rousing. So enjoy those beer keg graphics and bonus rounds and keep your eyes out for those free spins!